You know what I've realized? Instead of spamming my friends Facebook walls with my nonsense, boring status updates, I can use my blog to vent and express myself since this blog is all about me and nobody could complain (not that anyone thought that my status updates where annoying... I think). One of the values of the professional nursing practice is social justice: meaning each patient should be treated like everyone else, irregardless of race, religion, culture, or beliefs. Nursing ethics suggests that nurses should embrace an egalitarian attitude and promote fairness where the people needing more care should be prioritized. I believe that most nurses would be guilty like me for having favorite patients who I would rather spend most of my time caring for them. It's only natural that people will stick around with other people who are positive, friendly, and have a sense of humor. I know that care should be given more to someone who needs it the most, but if you're presented with a person that is rude and aggressive as compared to a nice and compliant patient, you would choose the latter as well and focus more of your time on meeting the nice patient's needs, even if the rude patient required more assistance. Some would say this is wrong but we have to all remember that respect is mutual: it is a two-way process. It is in our nature to have preferences. In my opinion, it would only be unethical if you don't meet the needs of your other patients while spending most of your time with your favorite patient. On the other hand, nurses should always advocate for their patients, even if the patients are rude, and believe that their disease is what's causing their behavior. Being abusive is a completely different story, nurses shouldn't place themselves in a position where patients could verbally and physically abuse them. 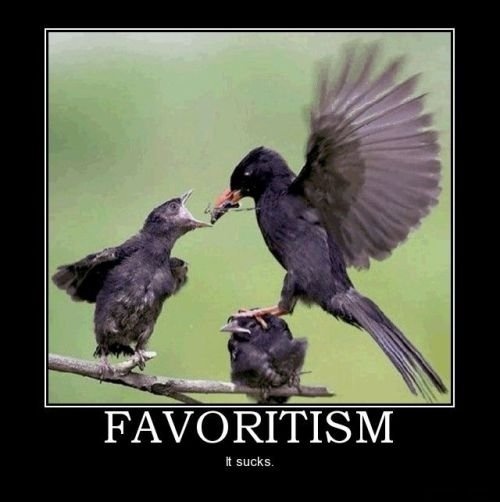 Favoritism may lead to negative results as well, such as being biased and neglecting other patients and having a clouded decision making skill since all you are focused on is what you believe is right for the patient. This is why nurses shouldn't take care of family members at work. Again I personally believe that there is nothing wrong with having favorite patients but you have to maintain a professional patient-nurse relationship with that patient and you should meet the needs of other patients as well.